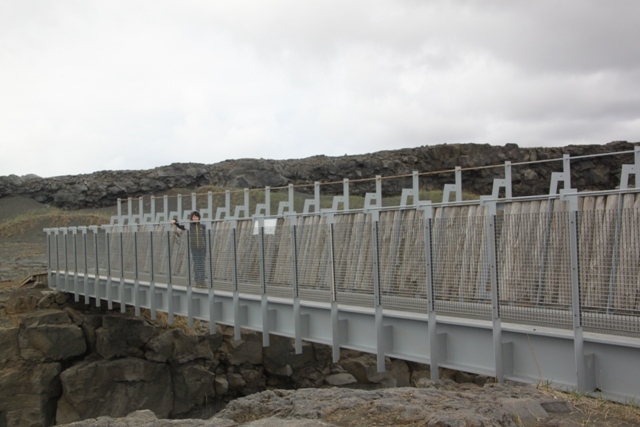 A short 10 minute drive from Keflavik and you are at Garour – the very tip of the Reykjanes Peninsula. Garour is a tiny fishing village. There are a few houses – some are so tiny – the smallest houses I have ever seen. 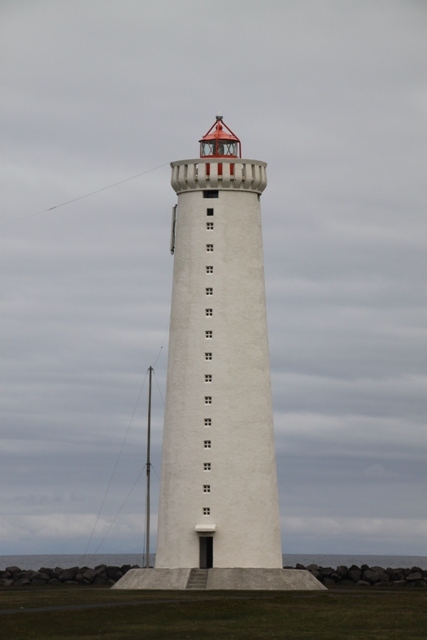 Our 9 year old was desperate to go and check out the lighthouse. There are actually 2 – an old one and a new one (built in the 1800’s). 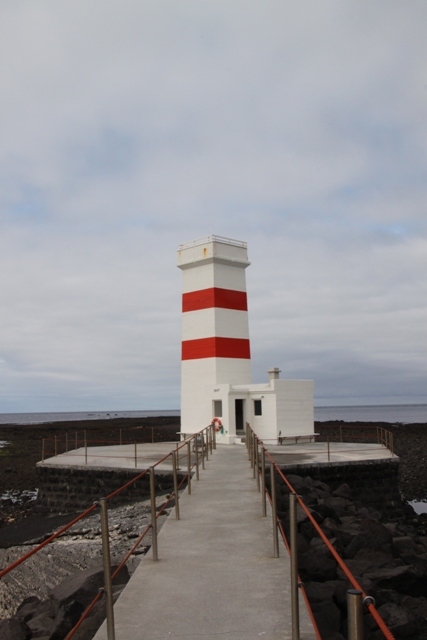 The old one is not used due to sea erosion. The new one is impressive, tall and gleaming white, but you can’t go inside, just admire from afar. The 9 year old was not impressed. We left Garour and what seemed like the last vestiges of civilisation. We drove for miles without seeing any cars, houses or people. 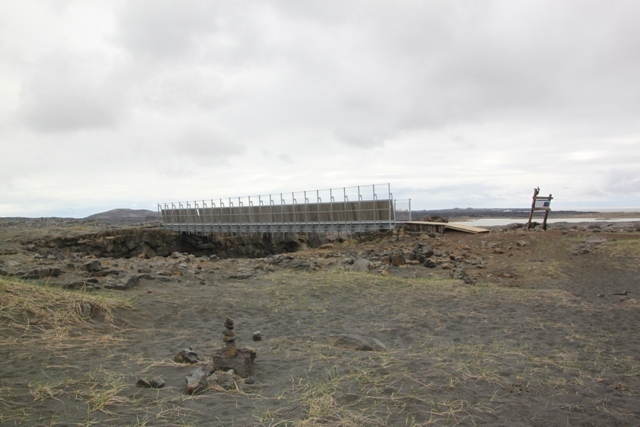 A strange, eerie landscape – lava fields stretching as far as the eye can see. This is such a wild and untamed land – it is fascinating. The lava fields are beautiful in a strange, spooky way. 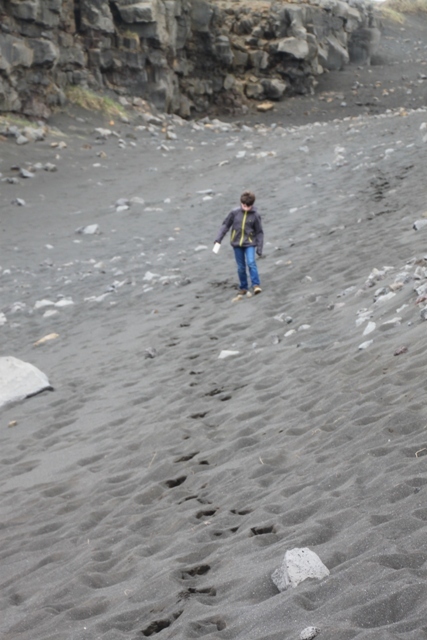 Some were the finest black lava grains, others were full of huge, black boulders. 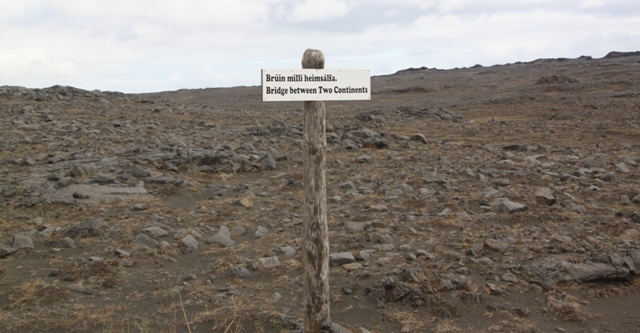 We stopped again at The Bridge Between Two Continents. We nearly missed the sign, it is fairly small, maybe everyone else did too, because there was only one other car in the car park and one lady on the bridge. I don’t understand why this place seems to be off the tourist trail – not complaining mind you, but it puzzled me. It is really fascinating. 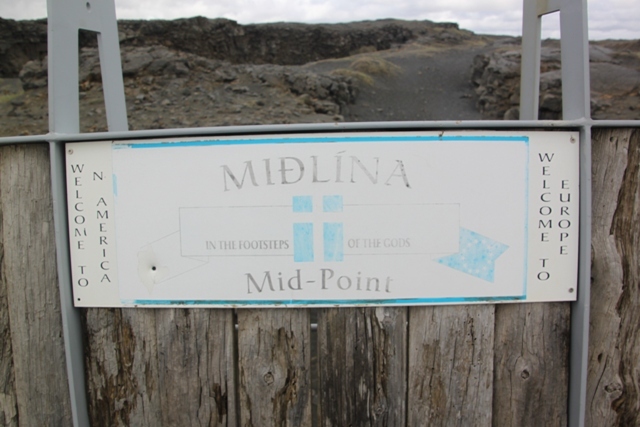 The whole peninsula lies on the Mid Atlantic Ridge, the Eurasian and North American tectonic plates are continuously drifting apart and causing fissures to form. Here is a major fissure. 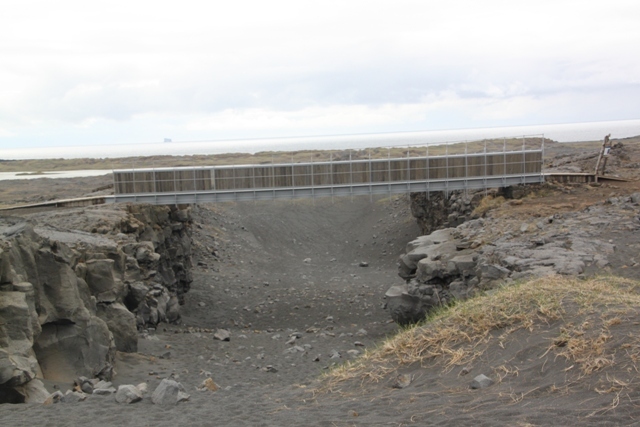 They have built a bridge over it to symbolise crossing the continents. Our 9 year old loved this idea – crossing from Europe to America over a bridge with one foot in each continent. He played with the fine volcanic ash – taking it from Europe to America, back again and mixing it up. 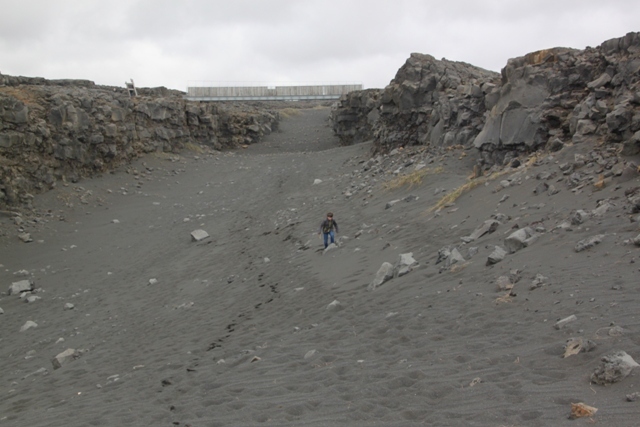 We walked over the bridge and then down between the plates through the fissure. It was an icy cold day – teeth chatteringly cold – but the ground felt warm and if you dug deeper it got hotter and hotter. 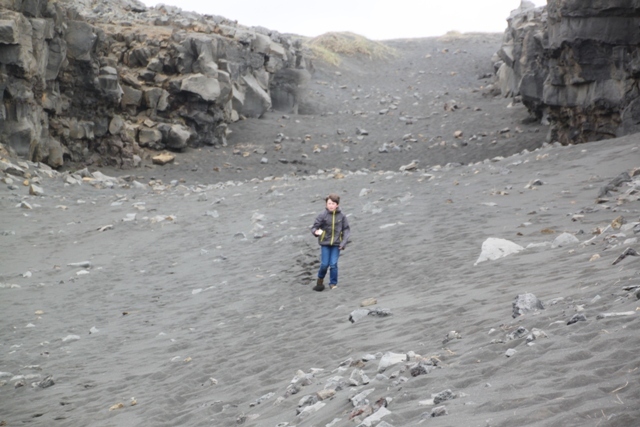 The black, powdery, volcanic ash was everywhere and gets everywhere – our boots were covered and as a result it went everywhere in the car afterwards. This is such a cool place. Really educational – geology comes to life, beautiful and beautifully deserted and mind blowing to think of all the activity going on down below your feet deep in the earth.